As one of 3 volunteers working on the Guardian Archive project ‘What the Papers Say’, I am assisting in cataloguing the correspondence collection and my focus is Women’s Suffrage. The Suffragette movement was at its height during the early 1900s prior to WW1 and this is reflected in the correspondence of C.P. Scott. There are letters from prominent suffragists of the time and also politicians and journalists both supporting and opposing votes for women. Scott was a supporter for Women’s Suffrage though did not agree with the militant tactics taken up by The National Women’s Social and Political Union (WSPU), whose leader was Emmeline Pankhurst. One of the letters to C.P. Scott from Emmeline Pankhurst gives an extremely personal insight into the complete and absolute commitment of these women to the cause. 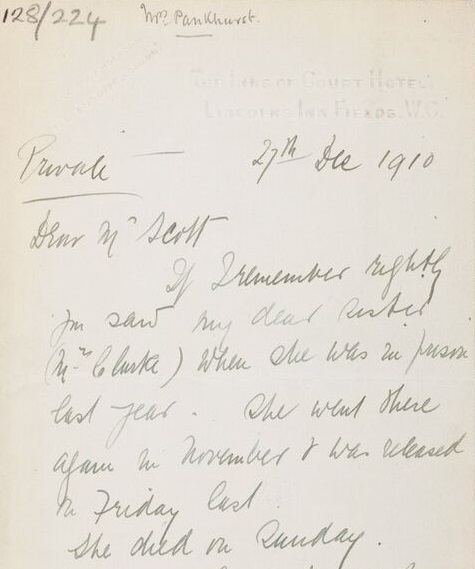 The letter, sent on the 27th December 1910 informs C.P. Scott of the death of her sister, Mary Jane Clarke, who died on 22nd December 1910. Mrs Clarke had been imprisoned three times in Holloway. In 1909 she had been among a group of protestors who had gone to number 10 Downing Street and tried to get an audience with Prime Minister Asquith. She was sentenced to one month in prison and was kept for some of the time in solitary confinement. C.P. Scott had visited her during this time and Emmeline reminds him of this at the beginning of her letter, going on to inform him of Clarke’s most recent incarceration, and of her death two days after her release. I write to you not only because you saw her in prison but because I believe you perhaps more than any English man alive out side the Cabinet have the power to bring this dreadful struggle to an end. In November 1910, a suffragette deputation went to the House of Commons to protest against Prime Minister Asquith after finding out he would not give any more time to the Conciliation Bill which had aimed to give some women the vote. The WSPU had agreed during the reading of the Bill to suspend support for window breaking and hunger-strikes. Mary Clarke was arrested the second time for window smashing soon after the event known as Black Friday. In her final stay in prison, Mrs Clarke went on hunger strike and was force fed, a procedure the prison authorities had brought in at the end of 1909. It is thought the traumatic effect of forced-feeding may have contributed to her death from a burst blood vessel. This year has seen the breaking for me of three of my closest bonds to this world, my boy, my mother and my dearest sister. Emmeline Pankhurst’s son, Henry had died in January of that year and along with her mother and sister’s death, this seemed to make her more determined to make her voice heard through the militant action she and the WSPU followed. Can you wonder that today I want beyond all other things to end this fight quickly and get rest? She is the first to die. How many must follow before the men of your Party realise their responsibility.